I want to start this post by thanking Stacy at Red Door Home for recognizing Tone on Tone as blog of the month in June. One of my first supporters, she has been a tremendous friend. Thank you, Stacy! I’m thoroughly honored. Speaking of friends, I’d like to share my friend Tracey’s beautifully renovated kitchen. A few things about Tracey: she is incredibly kind and family oriented; nuts about France; and very respectful of the architecture of her early 20th-century home in a historic neighborhood. In creating a family-friendly kitchen, inspired by France, Tracey handled the renovation with passion, care and respect for the original spirit of the house. 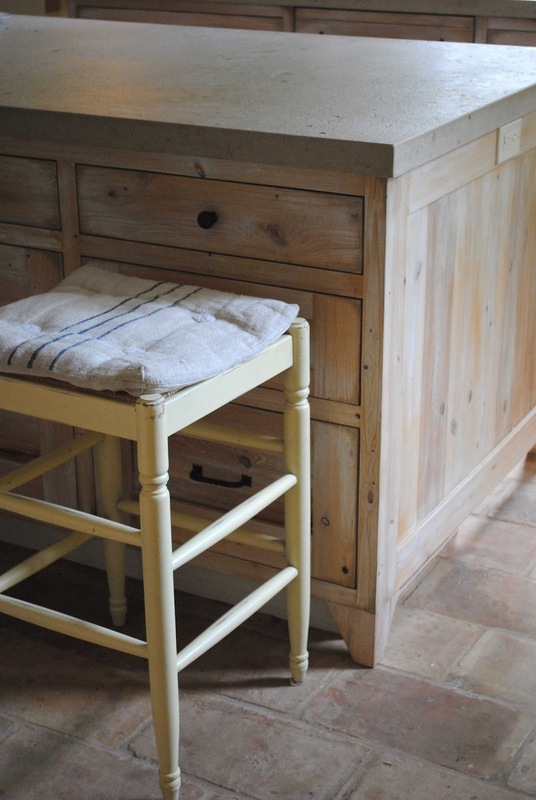 Tracey and her family wanted a French country kitchen with character and warmth. 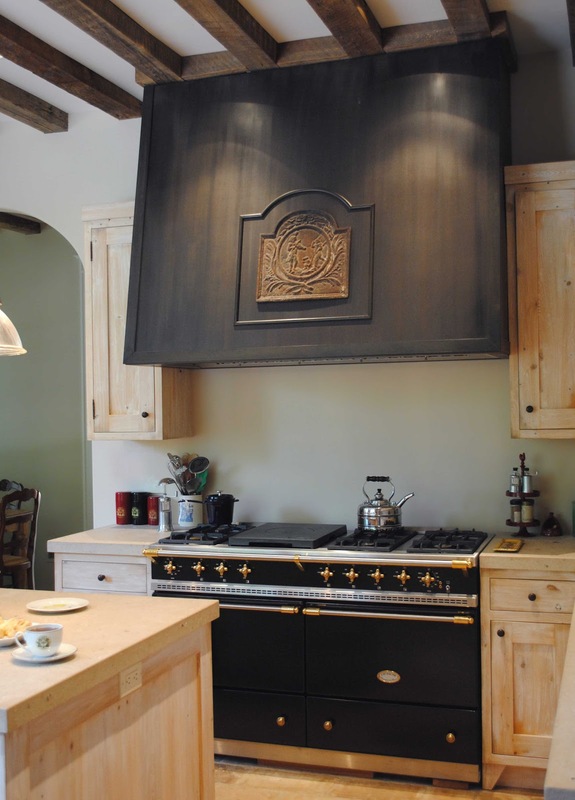 The French enamel range-oven is by Lacanche, and steel hood was custom designed around an unusually small antique iron fireback. Old tiles are being considered for the backsplash. Above is a photo showing the before. The 1980's picture window is now two double-hung windows over the farm sink (below). 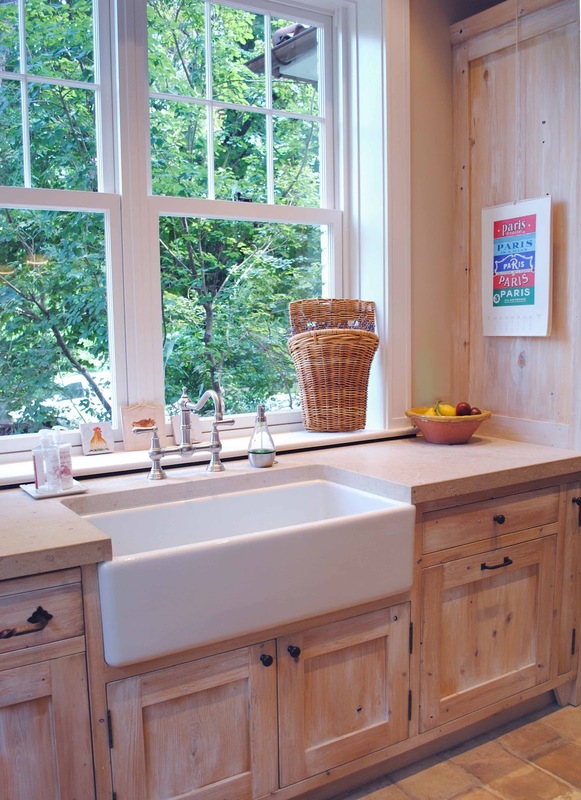 Open shelves and two sinks help make the kitchen accessible to all. We enjoyed tea with Tracey's homemade scones and her daughter's green tea cookies - yum! 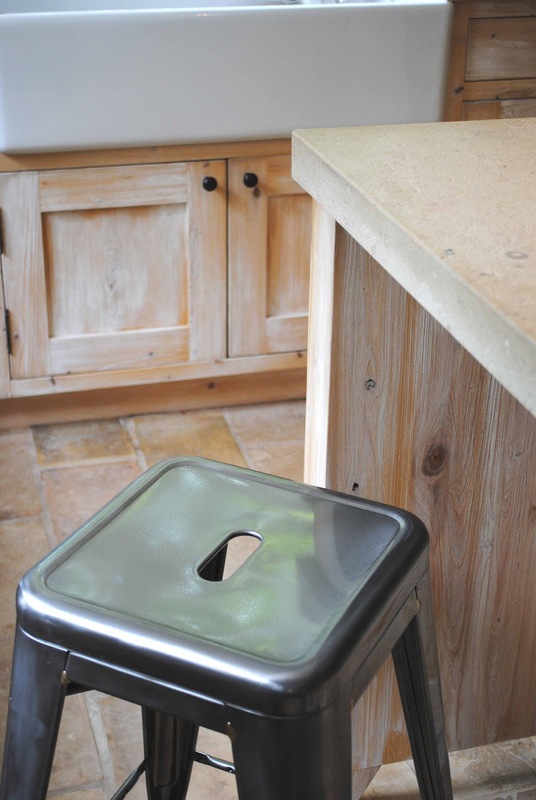 New Tolix counter stools from France. 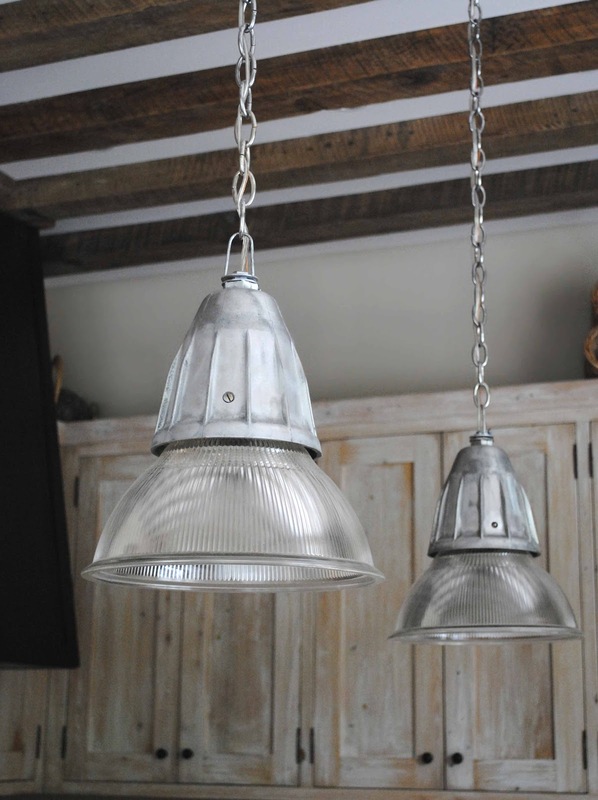 These vintage French industrial pendants are from my shop. I am delighted they found such a lovely home. The cabinets are cypress with a custom-aged finish with white-washed coloring. 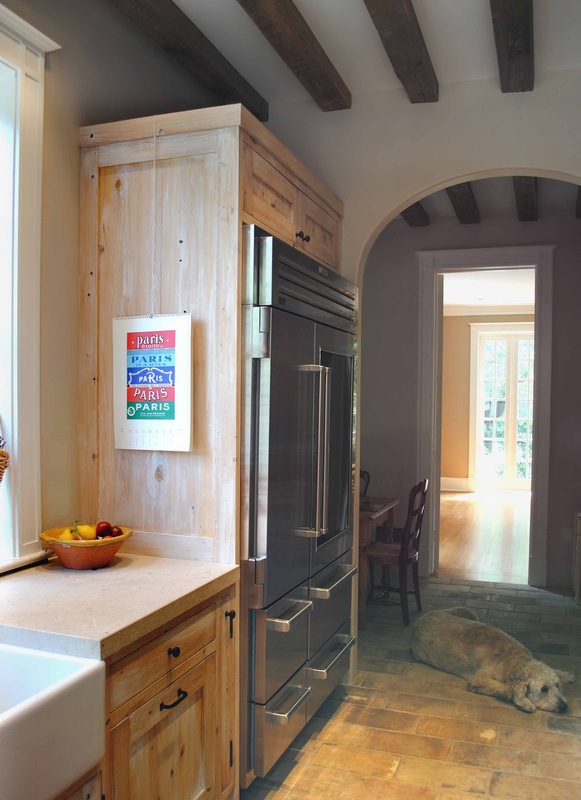 Reclaimed pine beams add cosiness to the 11' ceilings in the kitchen and breakfast room. Doesn't Moose (all 150 lbs) look dashing in his summer cut? The antique terra-cotta floor tiles were reclaimed in France. With specks of fossils throughout, the honed 2" thick Massangis Jaune Clair limestone countertops have a time-worn feel. BTW, coasters are not used on the countertops; isn't that awesome? I hope you all are having a good summer, too. A special thanks to Tracey and her family for allowing me to share their kitchen! It would be a joy to cook and hang out in this kitchen. It's warm, beautiful and functional. I love the use of materials. Those countertops and reclaimed tiles are DIVINE! So worn and loved. And I LOVE the vintage industrial lights from your shop - yummy!! Using reclaimed materials is SO the way to go if you want a character finish - I love that feel about all the homes that you show - they have character in abundance! Love the cupboards, tile floor, tolix stools, Moose and Sophie. Really neat kitchen, and I love kitchens. Now this is one beautiful kitchen, and it is obvious that life is lived here. 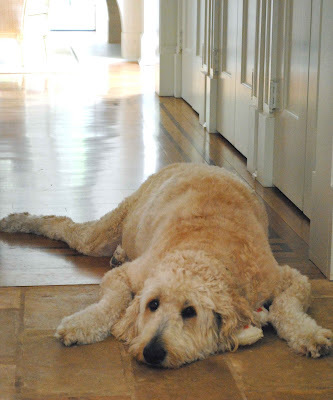 I love every inch, including the labradoodle! Beautiful. Thank you for sharing this friend and her home. Have a great weekend, Loi. Just lovely! I hope to be able to get your posts via email, so I don't forget to check! Thanks for sharing this Loi! Happy weekend! Wow, this is true to style and I love the floors, cabinetry, appliances, beams..very warm and practical as well. Isn't it fun to have tea with clients? Love it. Have a great relaxing day off tomorrow! Hi Phyllis - The counter tops are limestone: Massangis Jaune Clair. Such a beautiful kitchen! Thank you Loi and Tracy for sharing this beautiful space. Hi, Loi - Your lamps look great in that kitchen! And I like the creative way the antique fireback was incorporated into the vent hood — it's an accent that really sets the desired tone. Stunning! Love the countertops-such a nice change from the ubiquitous granite. The whole thing works so well it doesn't look new! Thanks to both of you for sharing this pretty space. Loi…this is incredible! I've been checking several times a day for a new post from you as I always love them and gain so much from them! Thanks for your kind comments as well! 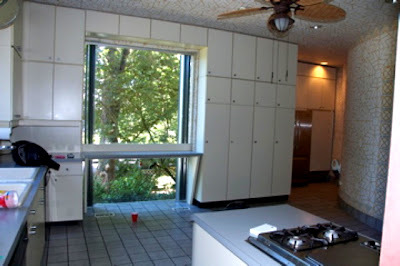 I really do love this kitchen…every aspect was obviously considered! It reminds me of when we re-did a farmhouse here that was 110 years old…difficult but fun! Lot's to consider when keeping it true and "respectful" as you said. There are definitely things I would do differently now if I were just starting it but it was a great learning experience! Hope you are having a wonderful weekend! Thank you for checking, Carolyn! I'm so delighted to discover your second blog!! Loi, that cypress cabinetry is simply stunning. I can see the happy smiles on the owners' faces and no wonder! This kitchen evokes a very warm, pure sense that I just love. Beautiful! This looks like a wonderful, happy,family kitchen. What a beautiful kitchen Loi. The cabinetry is wonderful it really has that raw handcrafted look that I love. Oh to have a kitchen like this. Beautiful kitchen and the cabinets are particularly attractive with their white lime-wash look. Wish you had a shop near me Loi. Wow Tracey's kitchen is fabulous! I love all the finishes and the fact they had respect for thier home. Lucky Moose to get to hang out on such amazing flooring. 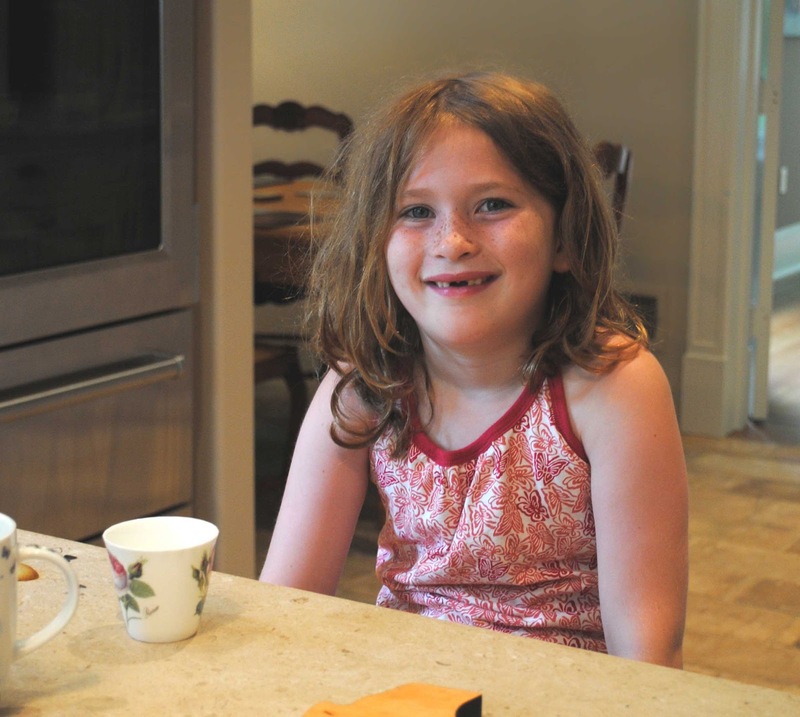 Sophia is cute with her two missing front teeth and freckles. Beautiful renovation Tracey! Great tour. The flooring is fantastic and I love those pendants. I love seeing beautiful renovations. This is a lovely, family-friendly renovation. I love the old floors and countertops, your lamps...and that Pro 48 Sub Zero refrigerator. Please thanks Tracey for her generosity. A lovely renovation! Love your lights and Moose looks like a love! Balanced, texturally interesting and inspiring. I see many fabulous meals and conversations in this stunning kitchen's future. I always love to see a great before and after! SO much to love in this kitchen. That range is absolutely gorgeous - I dream of having a range like that! I adore the bleached out colour palette too - so subtle and elegant, but still homely (AND it shows Moose's Summer 'resort wear' cut off in a most complimentary way - lol). A perfect family kitchen - wonderful! What a beautiful renovation! Love it! Please thank Tracey for allowing you to share it with us. Beautiful renovation! Tracey's kitchen is gorgeous - so warm and welcoming. The seat cushions are so pretty and the raw cabinetry is stunning and really compliments the floor tile. Love the vintage lighting from your shop!! Sophia is adorable and that pup looks so happy camped out on the floor :) Have a wonderful Sunday! Very nice, to those who like it. My favourite is the one called Moose, beautiful. Beautiful kitchen! 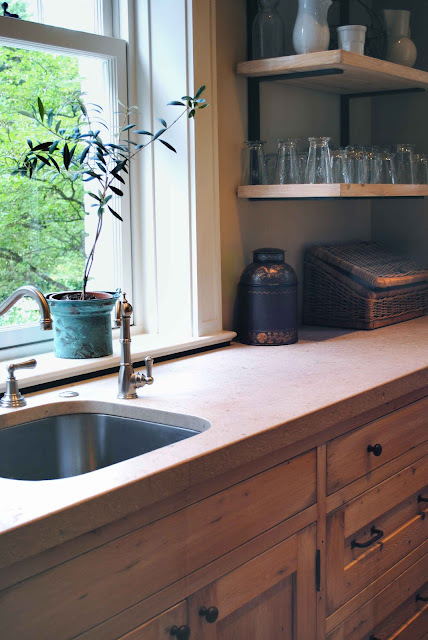 I was contemplating concrete counter tops to mimick limestone and now I am convinced, they are GORGEOUS! Thank you for sharing this great renovation! What an impressive renovation! So enjoyed touring this beautifully designed kitchen inspired by the French countryside. Although spacious, it is warm and cozy and definitely evokes feelings of family togetherness with its colour scheme and earthy textures. Love the chunkiness of the units, the powdery patina on the stone floors and of course, the farmhouse sink, which for me is signature country simplicity. Thanks so much for sharing this wonderful work of art with us. This is a summer treat. Lovely kitchen space and very unique materials used. Tracey is fortunate in that these days whatever you envision...is possible with patience, lots of good sources and a great crew to bring everything together. What a nice atmosphere to cook creatively in "the hub" of the home...an open kitchen. It is new yet it holds history nicely. Congrats on blog of the month for June your are a great blogger...we all know that lol! Hi Loi - what a wonderful post! I was wondering what the counters were made of, thinking they might be limestone. They are beautiful! I am looking forward to catching up on your blog, have been MIA from the blog world for a while but am ready to get back into it. It seems like it took 9 months to recover from building our new house! Holly - Three years later (after our renovation), we are still unpacking boxes. The countertops are limestone: Massangis Jaune Clair. Thanks for your visit! Hi Loi, beautiful kitchen! Amazing renovation. The materials, the warmth! I agree with adorable Moose, love the antique floor. Pendants look perfect! Such a happy family kitchen for lovely Sophia to come hang out in. Thanks for the tour & to Tracey & family for sharing. Loi, This was the first blog i came to this morning and it was a treat. I love all the choices she made to bring her kitchen together to create a perfect area for her family. Its artistic and creative. I also love that it is unique. The lighting she got from your shop- is like the icing on a cake. Fabulous. I love this kitchen! Thanks for sharing. Will be visiting Tracey‘s blog now. Have a great week! Hi Loi...it's my first visit. Introduced via A Perfect Gray. What a gorgeous, warm and welcoming kitchen. That custom vent hood is stunning! And, I loved the tour of your new office! Such a lovely kitchen, Loi! A great job indeed! Love the terra cotta floors which Moose seems to like too! Thanks for the tour and have a great week! wow! Those floors are the best! I love tactile surfaces like that in bare feet. What a lovely home. And yes, those light fixtures found the perfect home. What a lovely kitchen. I'm in love with that stove, and the antique floor tiles. Tracey did a great job, and made wonderful choices. Lucky her, that she gets to shop in your store. Maybe one day I'll make it to your area and I can pick out some lovely items for myself. Until then, thanks for sharing all your great photos. I see by your comment on my blog that you've had some devastating weather in your area and your garden suffered. I am so sad to hear that. I know you must be CRUSHED right along with all your beautiful flowers. Keep your chin up my friend, I'm sure you'll find a way to make lemonade out of the lemons. Hello Loi, what a beautifully done kitchen. I always love seeing a before image. Wow. Amazing that this is the same space! I'm thrilled that you added me to your blogroll!! Thank you! Oh my...where to begin? I LOVE this kitchen...love, love, love. The cypress cabinets are to die for...the flooring is fabulous...the counters, the beams and the farmhouse sink. The French stove!...and the tolix chairs. There isn't a thing I don't adore. And the 7 year old and pooch are pretty darn cute too! This is a lovely kitchen. I really love the reclaimed terra cotta flooring and the sink with the double hung windows!! makes the washing up less of a chore!! It has a lovely look and feel about it. Thank you for showing us. How wonderful you shared Stacey's kitchen renovation! Well, her kitchen is gorgeous! I love how the wood is stained and the stove and kitchen hood are just beautiful! I might see a Belgian style influence in Stacey's kitchen! Loi,concerning the Swedish writing desk that I am looking for, I tried all the Belgian antiques dealers without success. Yesterday I emailed some antiques dealers in Sweden and I do hope they will reply my email with good news! Well now I want to take a sledge hammer to my kitchen.....thanks. That kitchen is flipping perfect. What a gorgeous kitchen! I love the cabinet finish...or lack of finish...it' just wonderful! The lighting from your store was a perfect choice as well! Un caro saluto alla piccola e simpatica Sophia. Ciao Loi e buona serata! What a beautiful kitchen with a really great "feel good" vibe. I would hop over there for green tea cookies all the time too! Love absolutely everything about that kitchen! The finish on the cabinets is exquisite, love the flooring. perfect choice for the counter top, and love the lights from your shop! I am with Tracey...limestone counters look better with a little age & a few stains! Wow, what a great kichen redo. Just beautiful. I am getting ready to start a kitchen redo also. Love, love her antique floor tiles, do you know what company she got them through? Great blog post, just found your blog from A Perfect Gray. Will be visiting often. Thank you. 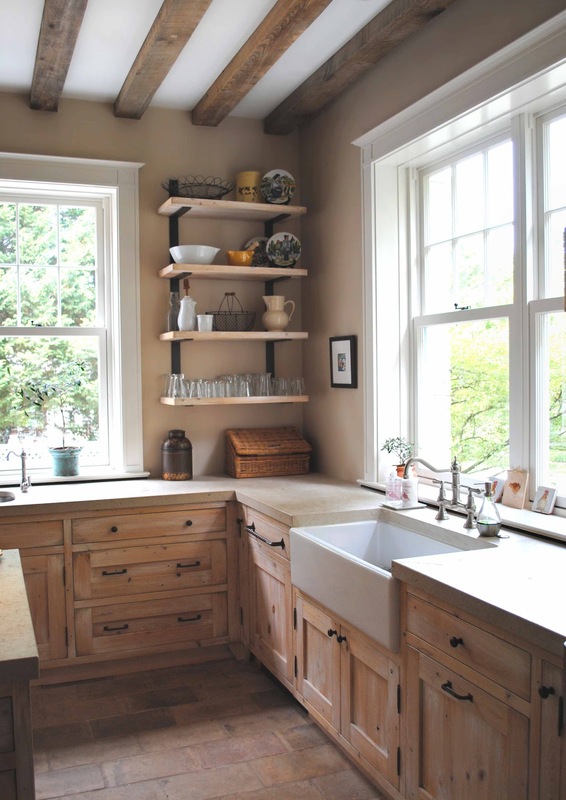 Gorgeous kitchen - love the white washed finish too and the set of open shelves. That hood is amazing! Cool beams and open shelving too. Most of all, love the 'coaster free' zone, (says so much about the family) Moose & Sophia's ~ beautiful smile. Thank you for sharing! What an incredible kitchen. And it will so stand the test of time. 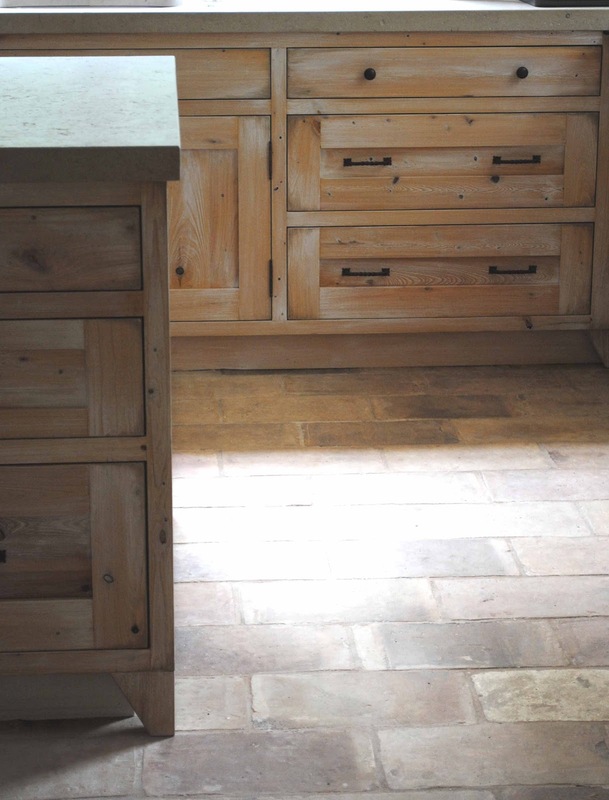 The floors are outstanding and I love the wood cabinetry. A real stand out project! BEautiful kitchen Loi! Love it! its really good job that you have done in designing such a beautiful kitchens. Love love love the floor. First time I've seen terra cotta that I've liked. Love the limestone counters also. Such great ideas. Lovely kitchen. So many beautiful elements, but my favorite is the Lacanche. It really makes the kitchen feel the most French in my opinion. Love the black and brass. I miss mine terribly! (Just sold our home in Houston with my beloved Lacanche.) Great work! Wow what a nice post. OMG!!! I just realized you did Tracey D'Angelo's kitchen!! I am friends with one of her best friends Courtney and feel like I know her!!!!! I was talking to Courtney tonight and was telling her how much I love your blog and she said I know him and I go in his shop when I am in Washington!!!! Too funny!!!!! What a lovely kitchen! Thanks for sharing. For any other DIY-ers I used this cabinet/layout measuring guide when re-doing my kitchen. (https://www.cabinetstogo.com/measuring-guide.html). Saved me a lot of time and eliminated any guess work. Hope this can be useful to someone! your kitchen is beautiful !! Its a warm family gathering place and th perfect inspiration for cooking & baking. Enjoy !! If you would like to grow your know-how just keep visiting this web page and be updated with the newest gossip posted here.